List: E10 Engine Damage & Performance Issues. 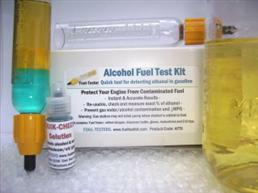 An ethanol fuel test kit (fuel tester and quik check) will prevent engine damage, performance and driveability issues due to E10 ethanol blends of gasoline. Phase separation, water contamination, parts damage and more. Without necessary precautions and careful monitoring, ethanol alcohol blends of fuel now being widely distributed at public gas pumps may cause unnecessary and unexpected damage to your gas-powered engines. In newer engines E10 oxygenated gasoline can be safely used with only minimal inconvenience, such as decrease in mpg and fuel efficiency. However, many other types of engines are not designed to resist the damaging effects of ethanol (ethyl alcohol) fuel. All gas-powered engines can be adversely affected by alcohol-blends of fuel including automobiles, classic cars, trucks, recreational vehicles, marine engines, motorcycles, lawn equipment, etc. - Use of E10 in engines not designed or resistant to alcohol. (Check your owner's manual). Read eninge manufacturer ethanol fuel recommnedations and warnings. E10 is now being sold all over the U.S. due to federal renewable fuel laws and mandates (quotas). Unfortunately, several states still refuse to inform consumers when gas dispensed is oxygenated with alcohol. Until renewable fuel standards (RFS) become more consumer-friendly, with the state and federal laws requiring more careful monitoring at the gas stations and fuel distributors, we encourage your to test fuel for alcohol and familiarize yourself with possible damage and problems that can result from the use of ethanol blends of fuel. Note: The list below does not include all documented damage attributed to E10 gasoline use. We have chosen to include only the most common damage/problems, based on verifiable reports and resources. Listed below are examples of problems and inconvenience that may occur from ethanol (alcohol) and contaminated E10 gas. IMPORTANT: Most newer engines can run safely on E10 blends when gas is fresh and of high quality. Some engines are not designed for use of gasahol, and even following all precautions will cause damage. (Check your owner's manual for fuel recommendations). However, E10 damage is most often due to gasoline "contamination", and would not have occurred had the E10 fuel met all ASTM quality standards. Gas at time of purchase contained over 10% legal limit for alcohol, excess water and/or tank not properly cleaned and dry prior to switch to E10. Ethanol is a strong solvent and cleanser, and while small amounts will keep your engine clean, excess alcohol will wear down engine parts. Ethanol's water-absorbing qualities are most problematic, but can be managed when fuel is stored properly and replaced often. Ethanol attracts, absorbs and holds moisture in fuel tank with increased occurrence of lean, water-diluted fuel. 2. Vapor lock or fuel starvation- Most common in carbureted engines, hot weather and/or at high altitude. (Ethanol increases gasoline's vapor pressure). 3. Drop in octane (after water absorption, P/S and W/C occurs). 4. Decreased fuel efficiency and mpg due to lower energy. E10 Reformulated Gasoline = 111,836 BTU/gallon. Non-ethanol Gasoline = 114,000 BTU/Gallon. (Diesel and Kerosene Jet Fuel have about 129,000 BTU/gal). 5. Decreased life cycle of parts and engine. 6. Decreased shelf life of gasoline. 1. Wear and damage of internal engine parts. 2. Damage to metal, rubber, and plastic parts of fuel system. 3. Corrosion of metal parts in fuel system and engine. 4. Deterioration of elastomers and plastic parts. 5. Deterioration of non-metallic materials. 6. Fuel permeation through flexible fuel lines. seals and other rubber components. 9. Damage or premature disintegration of fuel pump. 10. Carburetor damage, including clogging. 11. Dirty and clogged fuel filters. 12. Clogging and plugging of fuel injectors. 13. Destruction of certain fiberglass fuel tanks. 14. Removal or fading of paint and varnish (both internal and external parts of engine). 15. Piston/bore failure through knock/pre-ignition. 17. Unsuitable ignition timing resulting in ignition failure. 18. Gumming-up of fuel injectors, carburetors, etc. due to release of accumulated deposits in engine from ethanol alcohol's solvent properties. 1. Engine performance problems, often simply due to lower energy of ethanol-blends. 2. Hard starting and operating difficulty. 3. Hesitation and lack of acceleration. 4. Stalling, especially at low speeds. List update in progress 2009 - Contact Fuel-testers for more information. Read More on Engine Problems Resulting from E10 Ethanol Alcohol Fuel Use. Read Ethanol or alcohol-based fuel additives and gas treatments will increase risk. Additive list that includes alcohol content and water solubility. For access to all pages and articles in website. is the best preventive measures you can take to avoid unnecessary E10 problems.